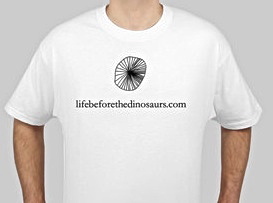 Life Before the Dinosaurs: Life Before the Dinosaurs t-shirt giveaway! My favourite creature is Opabinia (ever since I read about it in Wonderful Life). However, my favourite blog post is Orthoceras, because now when people ask me what that polished rock is on my desk, I can tell them the answer. Tribrachidium, without a doubt. Trilateral symmetry! You can't spell "Wiwaxia" without "Wiwaxia"! Hallucigenia. Cool-looking, with a killer-cool name. I vote for 'Dimetrodon', my favorite synapsid. However, if Art would only write up 'Meganeura', my favorite Carboniferous bug, I shall change my vote. Super difficult to choose, but I'd say Dunkleosteus. It ate everthing (even its own) AND had eyeballs with armor! Your Gmaw is so proud of you!! I'm going to do Meganeura for you tomorrow! Dinomischus. Just love that they look like flowers. Even more, Art, I love that you have started this blog and that you continue to explore and write (and now feature your artwork!). This is a wonderful expression of who you are. Keep it up, buddy.... Mrs. J.
Cothurnocystis, because it's such a strange and alien looking organism. Hmm... I'm going with Tullimonstrum. Mysterious and (I think) cute! Gotta love the name, too. I like this blog because you're such an excellent writer. Elrathia is my favourite. By the way, thanks so much for doing Meganeura. They're gorgeous! Lanarkia. Not often you find a fossil that's almost entirely limited to Scotland! I think there's a third sp, by the way. L lanceolata? Great 'blog! Keep it up. I love Life Before the Dinosaurs! Comments for this post are now closed. Thanks to everybody who entered the giveaway!